WELL SITES, ACCESS ROADS, DRILLING SUMPS, AND SITE CLEAN‑UPS. · Yemen Hunt Oil Company ‑ Block 18 – since 1988 on going. · Total Fina Elf E&P Yemen ‑ Block 10‑ since 1997. · Clyde Yemen – Block 32 ‑ 1997. · British Gas ‑ Block 9 ‑ 1995. · Transport of the equipment/material and service. · Road construction and maintenance. 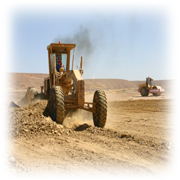 · Supplying of construction equipment, personnel, and material. · Construct the well sites location and sump, cellar and conductor. · Construct the fencing and gates. · Construct the camp site and access roads. · Construct the sewer pits. · Construct the water reserve pits. · Maintenance and rehabilitation of the roads and drilling location during the drilling phase. · Clean‑up, the standard practice in Yemen is to recover the material removed from the sumps after the sumps have dried out. The process Can be hurried by squeezing the water out into the location to dry, and then pushed into the sump.